Dr. Nelson Mejia Jr., chief executive officer of MCE Shipping Lines, said passengers from the southern towns and cities of Metro Cebu will have a maximum travel time of 30 minutes when the south coastal routes start April. 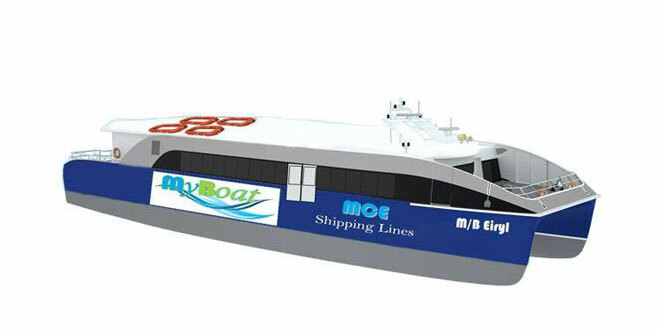 Mejia said a huge catamaran that can carry at least 64 passengers is now 90% finished and will soon be delivered by its manufacturer, Steven Deans Marine Inc., a Maritime Industry Authority (Marina)-accredited shipbuilder in Liloan, Cebu. Aside from a catamaran that will be serving passengers, commuters can also choose to ride in a sea jeepney—a 15-seater speedboat—for shorter travel routes. According to Mejia, commuters will have a maximum travel time of 30 minutes from Naga City to this city’s Pier 3. He added that the company is also planning to put two more coastal travel lines—Minglanilla-Cebu City and Talisay-Cebu City. “Minglanilla to Pier 3 will take you for only 20 minutes. When you are from Talisay, you only have 10 minutes to reach Cebu City,” he said. “Our business plan is research-based model being considered by maritime and land transport experts,” he also said. The 27-year-old CEO said he is willing to share his business model. “Traffic congestion is a sign that there is progress in a place. On the other hand, each one of us has experienced traffic. Sea transport system will augment such problem,” he said, citing Japan International Cooperation Agency’s first quarter of 2018 studies, which said Metro Cebu’s traffic has translated to P1.1 billion in economic and opportunity losses. Mayor Elanito Peña said his town of Minglanilla is willing to provide the company with a parking space so that motorists who wish to go to the city would not have to take the congested south national highway, and take the catamaran or sea jeepney, instead. “They have presented to us their proposal and we studied it,” he said. The mayor said the company needs to negotiate with a private firm, Primary Structures that is currently undertaking a reclamation project in Minglanilla’s coastal barangay of Calajoan, in order to operate in the area. For his part, Mejia said they need only a short wharf in Minglanilla, where they can dock a vessel to pick and unload passengers.